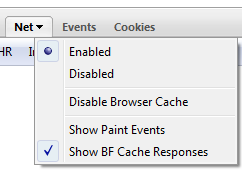 Another new feature that made it into Firebug 1.6a14 (available later today) is tracking HTTP responses coming directly from Firefox BFCache (back/forward cache) and displaying them within the Net panel. The purpose of this cache (note that this is different from the standard HTTP cache) is to make navigation in the browser history fast. The consequence of using the BFCache is that there is no HTTP activity (that's why it's fast) and so, till now these requests wasn't displayed in the Net panel. While I think it was actually correct (since purpose of the Net panel is to monitor HTTP activity), it was confusing sometimes as the Net pane was empty even if it was quite obvious that there need to be some requests. So, the feature is optional (on by default). All responses coming from the BFCache are displayed in gray. See the next screen-shot that shows what happened when I pressed the Back button. BFCache response could be hidden behind an extra entry that clearly depicts that it's BFCache related. This would make the Timeline column a bit hard to read since there would be empty rows in the waterfall diagram, but perhaps nobody is interested in that if it doesn't come from the server and there is not HTTP communication anyway. Any tips how to cut the Gordian knot? This might stop a quite annoying behaviour of Firebug. Maybe not. Often I have firebug minimised or off when I load a page. I might navigate back to a page I've already loaded, open Firebug and there's no net panel content. I guess Firebug needs to have been on when the page was initially loaded to have 'recorded' net data that it can show when browsing back to that page? Nuts. I do wish that Firebug performed well enough to be constantly on for all tabs. Oh well. @pd: Yes, Firebug needs to be initially loaded. You could solve this by right clicking on the Firebug icon (in Firefox status bar) and picking "On for All Web Pages". Firebug should be always on and so Net panel always showing all requests. I like the idea of displaying the request in grey, as it indicates a somewhat "inactive" request. You could _additionally_ display an icon representing BFCache. The icon should be between the [+] button and the "GET ..." text. The image title should be set, so when hovering over this icon, "Read from BFCache" could be displayed in a tooltip. I like the idea with the icon. Do you know somebody who could donate the icon artwork? This could probably also cover another problem Honza and I were discussing about lately at http://code.google.com/p/fbug/issues/detail?id=1208. Should requests fetched from the normal cache (HTTP status 304 Not Modified) be also be shown different to normal requests? And if yes, how? So maybe a symbol would be enough here. What do you think? If there is no communication with the server, why a "200 OK" in the timeline? @Steven Roussey: That's the status of the page when it was loaded the first time. How can i translate firebug to my language? I do wish that Firebug performed well enough to be constantly on for all tabs. I might navigate back to a page I've already loaded, open Firebug and there's no net panel content. betterie: Right click on the Firebug icon in Fx status bar and pick 'On for All Web Pages' - Firebug will be on by default (if not black listed).